Blog — Sadie Saves the Day! What: A set of 12 pencils in the style of the original polygrade pencils. The range is from 5B–5H. Why: All watercolor artists need a good pencil, whether for sketching or for transferring drawings. These pencils are a fun option and very unique. What makes these special is that they are a limited edition group of pencils from a reputable manufacturer that make you feel like you are using a pencil from 1837. What: A set of six gold and silver watercolor paints. Why: These paint are lightfast, handmade in Germany by a family-owned company, and vegan friendly. If you are looking for an awesome gold paint, you can stop searching. These are the best! I have never seen another gold paint that replicates real gold so well. What: A tin of water-soluble graphite. Why: this water-soluble graphite is made by a family-owned company in Portugal. They are one of the oldest pencil manufacturers in Europe, so they know their graphite. I love this water-soluble graphite, and it is really useful for sketching or learning to paint with values. If you only have one pain in your travel kit, this would be it. What: A super adjustable easel. Why: You need to take care of your neck and your back! It’s very easy to hurt your back bending over a table painting watercolors. This easel is the solution. It can adjust in many different ways and hold both papers and canvas. What: Sets of vegan Handmade watercolors in half pans. Why: These paints are super high quality, very pigmented, and a great deal. They are handmade by an artist in Berlin, they are vegan, and some of the funds go to workshops that teach art to a wider audience. So not only are you getting unique paint, but you are supporting a good cause! Art Supply Review: Eventually Everything Mixes — Sadie Saves the Day! What: Kolinsky Sable brushes made by three different manufacturers at three different price points. Da Vinci - there isn’t much to say about this brand, only because everybody knows that they are synonymous with quality. These are some of the best of the best. Every single brush that I have bought from da Vinci has been beautiful and amazing. They are robust and the points remain over time. Kolibri - This is probably not a very well-known brand, especially not outside of Germany. However this small family company has been making brushes for a long time. They have a small line of Kolinsky Sable brushes, called their gold line, which is an amazing value for the money. Some even say they are better than the Winsor and Newton Series 7s! Most cheap Kolinsky Sable brushes are not worth your time or mine, but these are excellent and I use them daily. Rosemary & Co. - I don’t personally have experience with this brand, but this small, woman-owned company is the favorite of many watercolorists. What: A set of 22 Rembrandt artist grade watercolor half pans in a wooden box with a porcelain palette. 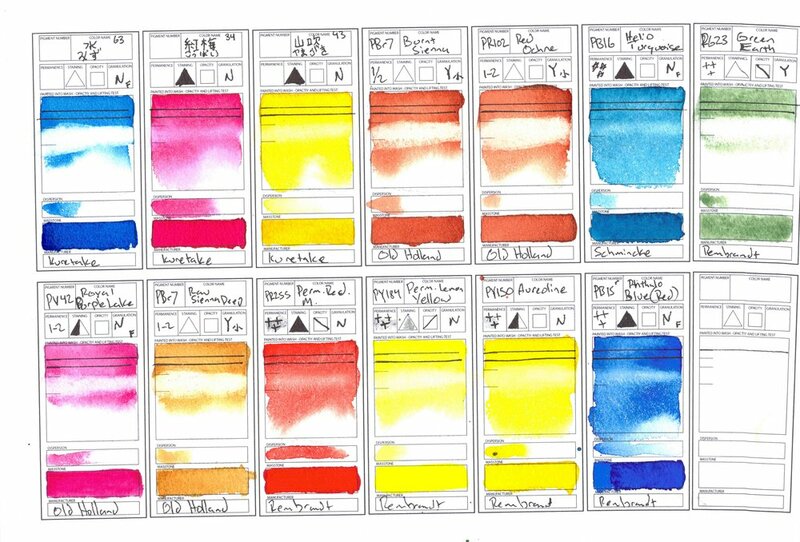 Why: This Dutch brand is high quality, and the watercolor paints have a full range of colors. Not only that, but every watercolorist would be happy to have a ceramic palette to paint on. What: This is a set of 10 tubes of water colors, one porcelain palette, to brushes, and one towel. Why: Of course Sennelier is a brand that is renowned for making watercolors that are vibrant with a special ability to glaze effortlessly. But this set is also just extremely convenient. It has everything that you need to paint except for water. I’m actually surprised that they included towel, because this is an aspect that most watercolor kits miss. What: 24 tcubes of Schmincke watercolors in a wooden box with a porcelain palette. Why: There isn’t a single watercolorist who would be upset if you gifted them this set of watercolors. You get a full range of Schmincke’s colors plus a huge palette to paint with. What more could you want? Why: some of the colors in this set are only available through this gift box. You cannot get them in any other set. Since these are definitely the best watercolor pencils around, it is a great gift to get not just the basic set, but the full range of colors! What: A handmade watercolor box with your name on it. Why: ! Even though there is a long waiting time, it is definitely a special gift to have a watercolor palette made specifically for you. You can get your name on the pallet, and it comes with a free leather pouch, and space for 18 hole pans. It doesn’t get much more luxurious than this! 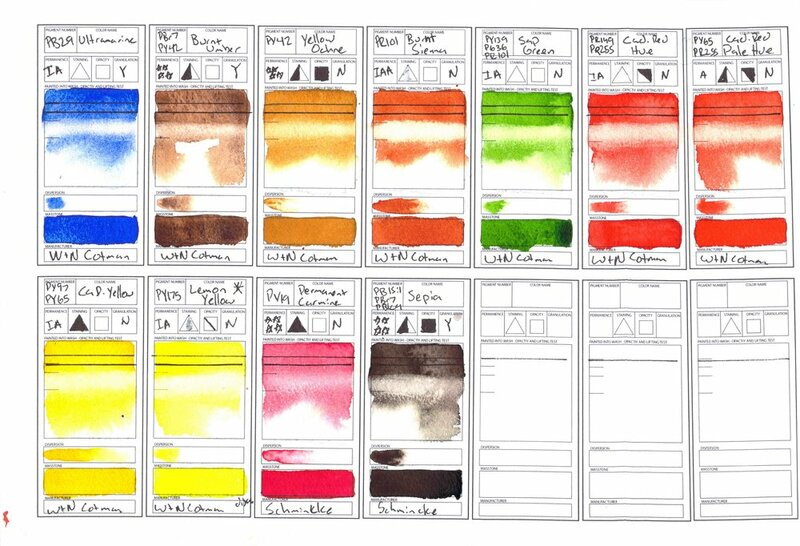 I have been wanting to make a sort of watercolor resource including swatches of all the colors I have been able to get my hands on. Since that would mean watching all of the colors in my palate, I decided to take this as an opportunity to talk about the colors that I paint with regularly. At the moment there are 42 colors in my main palette, although that’s probably way more than I need. My palette is in a state of transition, and I’m really trying to figure out what yellows and oranges are important to my painting. In addition to those 42 colors, I also have 38 other colors that are not in my main palette. They are either redundant, not exactly fitting my needs, or waiting their turn to be put into the pallet. The way I choose colors is pretty simple. I want high quality, single pigment colors, that are fairly non-toxic. I stay away from cadmium, cobalt, cerulean, manganese, and viridian paints. I also want my colors to mix well and try to avoid repeating the same hue unless there is something very different in the characteristic of the watercolor. The brands I choose are often determined by whether the pigment I want is available in the brand, the quality of the pigment in that brand, and the price. As you can probably tell from this list, I have some kind of yellow obsession. For a while I was on the hunt for the coolest yellow possible, and I think that I have finally found it with Nickel Titanate Yellow. Still I am tinkering around to figure out the best combination of cool, warm, and middle yellows, so my palette is kind of a mess. This is the coolest yellow that I have been able to find. Unfortunately, it’s a bit opaque, but it makes the most vibrant greens with phthalo blue or phthalo green that I have ever seen! Note: You can mix this with nearly any color to make a pastel or milky version. I was lucky to find beef to discontinued yellow colors from Winsor and Newton on the sales rack at my local art store. They are both beautiful colors, and very lovely and transparent. Unfortunately, I don’t think that I will be able to find a replacement once they are out because the same pigments and other brands seem to have a different hue. My favorite middle yellow. Sennelier makes the best yellows, they just all glow. This warm yellow is a unique pigment to Old Holland. It’s also different because it is very transparent, but also very lifting. That is a rare trait for yellow paint. Most are very staining. I use this pigment instead of yellow ocher. It’s not quite as opaque, and has a nicer texture and some granulation. Naples Yellow is a very opaque paint, and not normally something that I would have imagined keeping on my palette. However I have found that it is really nice and glowing when extremely diluted. It’s useful for natural colors, beaches, and mixing into skin tones to give a little more weight to transparent colors. Do I even need to say anything about this color? It’s super famous. I actually changed how I painted once I got this color, that’s how useful it is. I love all of the Quinacridone colors. This is color that I use very often for portrait painting. A gorgeous brick red, this is a unique color to the Old Holland line. I use it sometimes as a substitute for burnt sienna that doesn’t granulate. I use a ton of this color for painting portraits, particularly of people with darker skin. I don’t like to use burnt or raw umber because they granulate. If you mix this color with Indanthrene or ultramarine blue, you get a super nice dark brown color. Probably the brightest and most saturated color on my palette. It just pops off the paper. Crazy dispersion. Crazy saturation. Just crazy. Another color that I use a lot for portraits. I just really love how soft and warm it is. Nice for a warm brown skin tones, or blush. If I were to narrow my palette down to a few key colors, this would definitely be on it. I mix this with pyrelene green to make the deepest darkest blacks. So I discovered this by accident. I had so many Quinacridone red colors, that I figured there wasn’t a reason to get another one. But I wanted to try a different pigment. And as soon as I decided to use Quinacridone read, I fell in love. This is just a wonderful, staining, transparent, mostly middle red. It’s lightly on the blue side, but I like my reds slightly cool anyway. Some people use these colors basically interchangeably. They both make wonderful purples when mixed with ultramarine blue. PR 122 is slightly better for this, but PV 19 is less of a finicky color when mixing with the right range of other colors. I don’t have a lot of purples because I like single pigment colors, and many purples are convenience colors or non-lightfast. Dioxazine Violet is often a fugitive color in many brands, so I stay on the safe side and go with my trusty Quinacridone. Normally I don’t have doubles of colors on my palate, but these two have very different characteristics. I often like to mix a warm blue that is not granulating, so Schmincke’s Ultramarine Finest is great for that. But when I want really lovely granulation, I go for the Old Holland. Probably my favorite blue. I use it to darken everything. This is my mixing blue. I find that it mixes nicer and gentler colors and ultramarine does, so it’s an essential color on my palette. Also the blue that I use when painting portraits. Phthalo blue comes in a red and a green shade, however if this pair is not far enough apart for it to be noticeable. I will probably replace the M. Graham phthalo blue with the new Rembrandt phthalo blue red shade that I have gotten. I didn’t think that it was necessary to have both phthalo greens, but having been a green yellow shade makes a really big difference in mixing greens. This pair is sufficiently far enough apart that they can be really useful and versatile. This is the last in the series of dark colors that I love. I use this, Deep Red, and Indanthrene Blue to add deep values to nearly every painting. This is the only convenience color on my palette. I just love the granulation and how the color separate. Even though I can mix myself, this is much more convenient. I use the color rarely, but when I do I’m very happy to have it. Another kind of odd color, that is really great because of its duotone nature. Mixes with purples and with yellows to make interesting browns and greens. Normally I don’t believe in using black in watercolor, but the granulation of this pigment is insane. I love using it just to play around, or to get texture in rocks. It’s too bad that this color is fugitive. It’s really beautiful. I don’t know of any other slightly granulating, non-staining, vibrant pink. Another fugitive color, which is why I do not keep it in my main palette. It is superduper vibrant, but I feel like I can see it fading even a few days after I have painted with it. I almost never use it. A color in between phthalo blue and phthalo green. It’s really vibrant, and almost like a tropical sea. You can mix this same color by mixing phthalo blue with phthalo green, but this is more convenient. It is a good cyan primary color. One day I would like to try Holbein’s PB 17. A fairly odd color in watercolors. I am always interested in single pigment greens that are non-toxic. It’s nice that it granulates gently. I could see using this a lot for nature colors. I would also like to try this as a underpainting for portraits. I saw this color recommended, and wanted to try it out as a pink watercolor. I don’t paint paintings very often, but I know that a lot of people do. This is very nice and pink, obviously not as pink as Opera rose. It is also a good magenta primary color. While many people use yellow ocher when painting portraits, I really dislike the opacity in the flatness of it. Raw sienna has a similar hue, but it is much less opaque, and much more vibrant to me. I would recommend this over the yellow ocher. These will probably replace the Van Gogh versions that I currently have a my palette. Since these are the artist grade to their student grade, it makes sense that these colors are more vibrant and transparent. As I said before, this will probably replace the M Graham phthalo blue in my palette. That’s all for now! I love to collect unique colors, and new brands, so this list will probably be growing soon. Here, I’ll write about watercolor, painting, and art in life. Sadie Saves the Day is on Patreon!! !